All of the data needed for assembly at a glance: 3-D machine documentation benefits technicians, customers, and the environment. Making production more efficient: Dr. Günter Schweitzer, Chief Operations Officer (COO) of the Business Area Tobacco. We always begin with these two questions: “Why do we do it this way?” and “Couldn’t we do it better?” As the innovation leaders of the tobacco industry, Hauni and the other companies in the Körber Business Area Tobacco play a pioneering role. That includes the area of digitization. 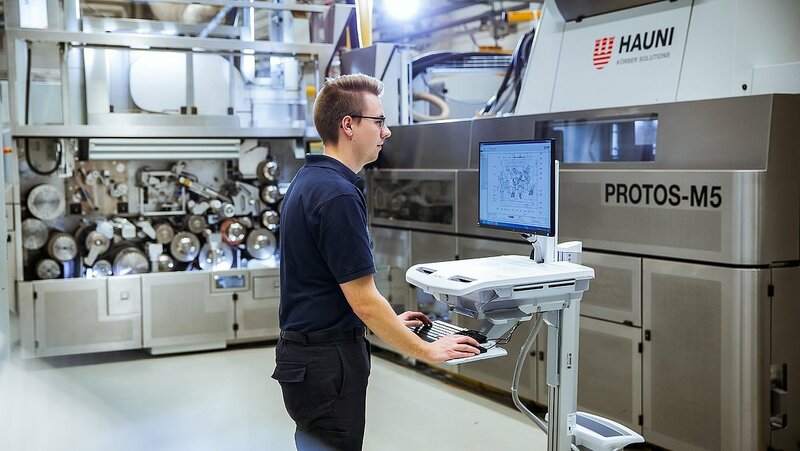 “We literally examine all the components of a process and analyze how digital technologies could help to make the work steps in production better, faster, and more efficient,” says Dr. Günter Schweitzer. 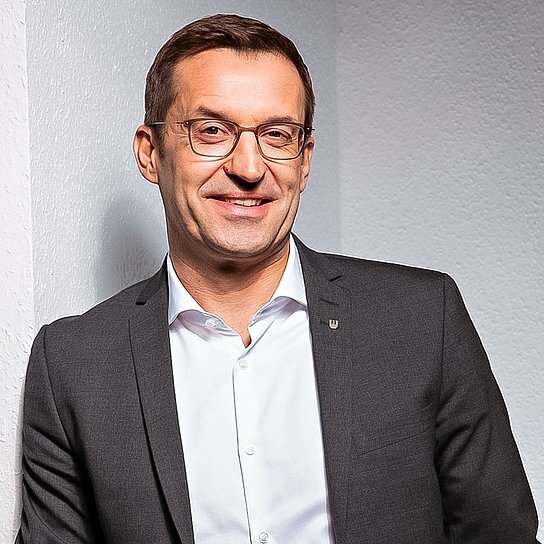 As COO of the Business Area Tobacco, Dr. Günter Schweitzer is responsible for all purchasing and procurement functions, all production and manufacturing areas, the production control of all secondary products as well as for quality and process management, including all improvement programs in the production environment. This is always done in close cooperation with customers — because the aim is to have the optimizations benefit both sides. We literally examine all the components of a process. One impressive example of the clever use of digital helpers is paperless assembly. This avoids mountains of paper and and reduces the impact on the environment. The second, equally important, effect is a huge increase of efficiency in the production process. “In paperless assembly, all the information our employees need for the production of our highly sophisticated machines is provided to them in digital form at a mobile workstation,” explains Schweitzer. This is a man-sized, ergonomically designed, and mobile workstation consisting of a computer, a display, a keyboard, and a mouse. It stands on rollers that make it easy to move. A powerful rechargeable battery guarantees independence from the power grid. The workstation enables assembly workers to access all the relevant information they need directly in the workshop. Previously they had to browse through thick paper folders, but now the digital handbooks, safety data sheets, and documentation are always close at hand – and come without any weight. 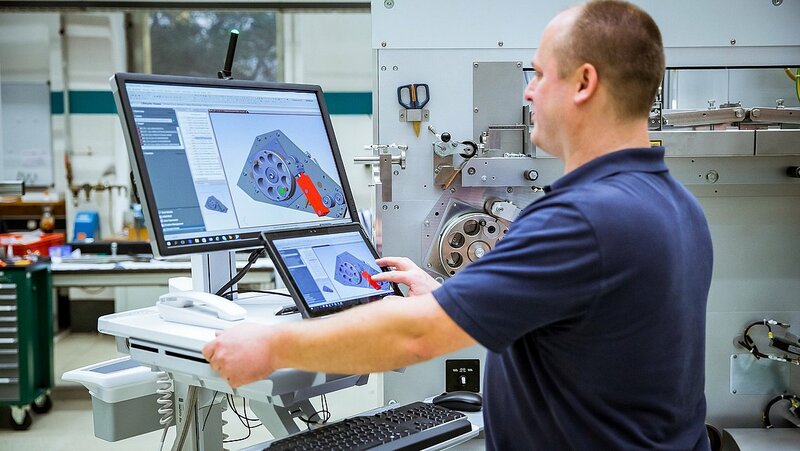 In addition, employees can call up 3-D diagrams, document quality inspections, and check to see whether all the components they need are available. In case an assembly worker ever needs to “descend into the depths” of a machine, he can take along a handy tablet so that he’d still have all documents on hand. In paperless assembly, all the information our employees need is provided to them in digital form at a mobile workstation. A complete overview: The mobile workstation enables assembly workers to access all the relevant information they need directly in the workshop. Paperless assembly: It avoids mountains of paper and reduces the impact on the environment. 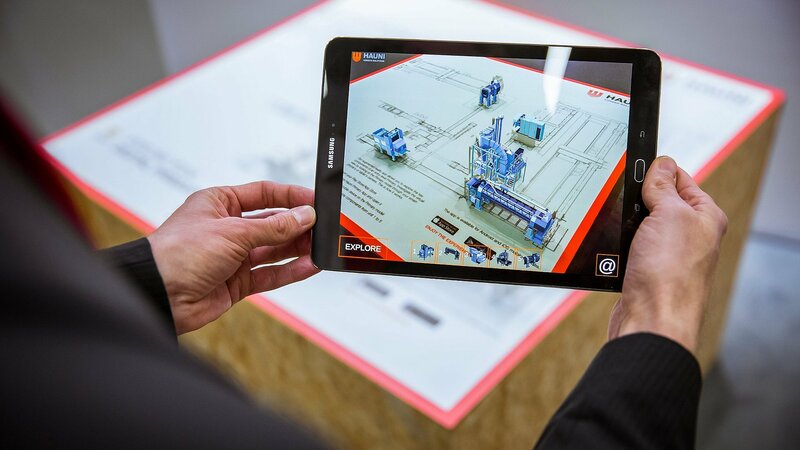 Handy: On the tablet, employees can call up 3-D diagrams, document quality inspections, and check to see whether all the components they need are available. Control on wheels: The approximately man-sized, ergonomically designed, and mobile workstation consists of a computer, a display, a keyboard, and a mouse, and it can be easily moved around on rollers. “By means of this workstation, all of the employees can communicate with one another,” Schweitzer emphasizes. Here in the assembly area, workers can directly experience the megatrend toward linking data and processing. Assembly operator Florian Klempau is enthusiastic about this new work environment. “At the mobile workstations we’re working with the same digital data models as our colleagues in the design unit, so we can coordinate our work faster and more easily,” he says. 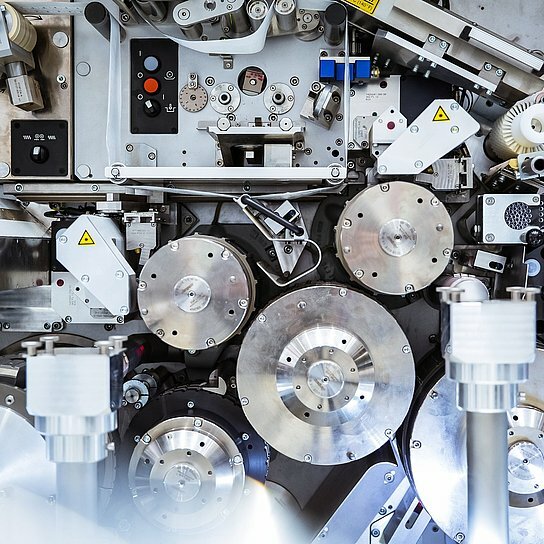 The 3-D machine documentation helps with the development and assembly of Hauni machines, but that’s not all. Most importantly, it also helps the company’s customers all over the world by enabling digital access to all the information that’s needed to operate, clean, and maintain the machines. “The 3-D data include precise illustrations of the entire facility. They can depict even the smallest details of individual assemblies simply at the tap of a finger,” says Schweitzer. For example, if a spare part is needed, it can be immediately ordered on the Hauni online shop with the click of a mouse. 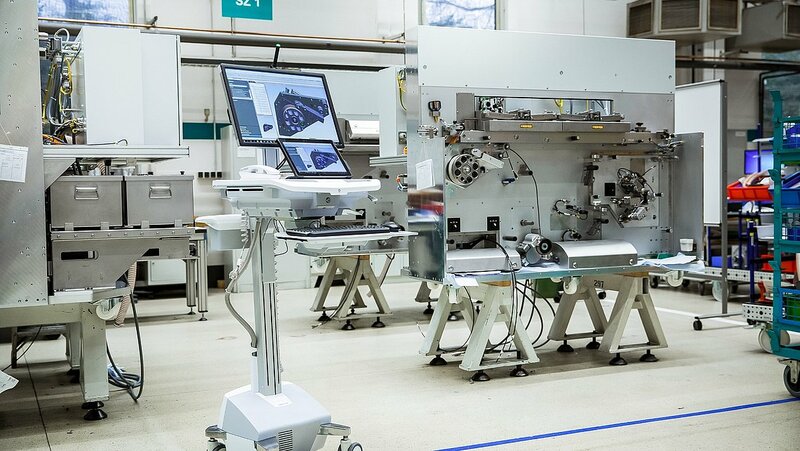 At the Hauni plant in the Bergedorf district of Hamburg, 20 workstations of this kind are currently in operation. The project is now being rolled out, because this solution has met with a great response from employees and customers alike. Almost 30 new units are being installed here, and over 150 units are being installed at various locations of the Business Area Tobacco all over the world mobility and networking have no more limits.